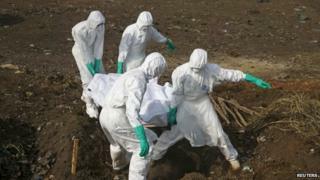 Five or six patients stood in the doorway of the Ebola treatment centre in eastern Sierra Leone's Kenema town on 23 June. Among them were two children in the white makeshift tarpaulin structure perched on top of a slope. They stood for a few minutes and nurses dressed in protective suits guided them to their beds. The adults walked like children learning to take their first steps. And the children had to be led by the hand. They were carried away like people being taken to the gallows. I would later learn that all of them died, except one. The sight of a girl among them, probably five years old, has never faded from my memory. Whenever I give my two-year-old daughter Anna her daily morning hug, or send her to sleep at night, memories have flashed back of the girl in the doorway who looked weak and emaciated even from a distance. I have developed a natural thermometer - the back of my hand - to check body temperatures, mine and the children's. The traditional thermometer resembles a syringe and scares my daughter, so I use my hand. It is a routine I have never needed before. When I drive and get stuck in traffic, it has become instinctive for me to place the back of my hand on my temple, neck and wrist. I pull the rear mirror to see if I do not have red-shot eyes - one of the signs of Ebola - and tend to repeat that process several times at home. Intermittently, I grab my viral gels to disinfect my hands just in case I may have come into contact with an infected person. As a journalist, I have covered civil wars in which I was shot in the legs and violent elections in which I was a target. But I have never felt as frightened and as close to death as I have while covering the current Ebola outbreak in Sierra Leone. I believe in eyewitness journalism, where possible, but the nature of the Ebola coverage has forced me to exercise restraint. The virus moves through human bodily fluids and, as a broadcast journalist, the windshield on the microphone could be a conduit for the spittle of someone who has the virus. That is besides the fact that I could make a mistake and touch an infected person. As a result, my movement is highly restricted. Sierra Leone is a malaria-prone country and, as a consequence, fever is a fairly common condition. The plasmodium parasite is the biggest killer of the country's children and has sent many adults to the world beyond. Since the Ebola outbreak, it is amazing to witness the relief of parents whose child has been diagnosed with malaria. These days hospitals here - both public and private - are effectively closed to non-Ebola patients. At home we have abundant supplies of gloves, second only to foodstuff, for emergencies like a fever. One of the biggest scares I have had throughout this crisis was when Anna fell ill. Her temperature shot up to 37 degrees Celsius. A paediatrician later gave us advice and prescription on the phone to treat her. She was fine the next day. In early August I felt a high fever which struck at the same time as a harsh stomach pain. The night felt as long as a week. I sent a text message to an Indian doctor who is a friend of mine in Freetown at around 03:00 am. He immediately called and asked me to see him later that morning. I isolated myself without my children noticing for fear of spreading panic, and informed the BBC. It transpired that my pain was caused by ulcers. Every feeling of fever or stomach pain these days is treated as suspicious. My children are locked in a virtual prison. With schools closed nationwide because of the outbreak, I stopped my eight-year-old son from attending Islamic school for the same reason. They spend days inside our gated compound with no direct contact with the outside world. And they are required to wash their hands regularly. After a bitter disagreement, my wife and I agreed to send our housemaid away - with pay - until the situation improves. The kids in the doorway of the Kenema Ebola clinic are just the tip of the iceberg. As of 16 December, 373 children had been lost their lives to the virus in Sierra Leone, according to the UN Ebola mission. A further 5,135 had lost one or both parents to Ebola. Whenever I think about these grim figures, I make an extra effort to be a good parent. I do this by being home for most of the day - and showing my children more love and giving them more attention. Ebola will leave us one day. But memories of this virus and how it changed my lifestyle and that of my children will be with me forever.